THE struggle by women to assert themselves as individuals responsible for their own development, unencumbered by chauvinism, is a tension that preoccupies their daily existence. With the weight of historical prejudice always bearing down like a millstone around their necks, women have unfairly had lives defined by patriarchal sensibilities and their manifestation – the epic battle of the sexes. Not for many women, though, is life today about subjecting themselves to social subjugation or, worse, living the stereotype of being perennial kitchen hands solely slaving to please the master. Where they have been able to break through the shackles of stereotyping, they have inevitably generated lingering doubts about their capacity to succeed without a leg-up. With constant allusions to man’s hidden hand spurring them to an elevated status, women have shrugged the prejudice and forged on regardless. They have come into their own reckoning without so much an aim to beat men in their own game as to forge their own destiny. Strong-willed Norma Ratcliffe, owner and wine maker at Warwick Wine Estate in the Cape wine lands, is such an individual. Acclaimed as a pioneering woman who successfully burst into the wine sector, Ratcliffe has 25 years and a string of award-winning wines behind her to prove her credentials. She remains distinguished as the first woman to be inducted into the Cape Winemakers Guild in 1989. Recently, she celebrated her 25th anniversary of wine making at Joburg’s 10 Bompas Hotel, with a nostalgic line-up dating back to her first wine, the 1984 Femme Bleu. From debut wine, the memory lane extended to the exquisite 1986 Triology, 1995 Cabernet Franc, 1997 Three Cape Ladies, 1998 Chardonnay to the boutique 2001 Femme Bleu. All the wines were a tribute to determined efforts of both Norma and her late husband Stan, and their two children – Mike and Jenny. 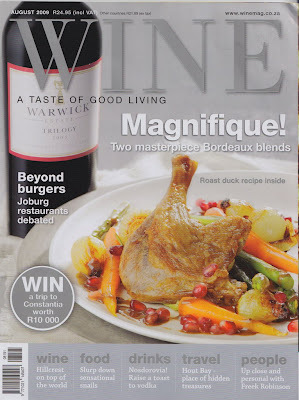 Today the family’s wines are a regular feature at top restaurants in SA, America, Asia and Europe. The best Japanese chef in the world visits Cape Town. Nobu Matsuhisa, the eponymous chef that founded the internationally renowned NOBU group of Japanese restaurants visited Cape Town recently. Here he is pictured during a meal at Belthazar restaurant in the Waterfront with owners Ian Halfon and Jonothan Steyn. in the Wine Spectator Top 100 Wines in the World. Join Mike Ratcliffe and the Warwick and Vilafonte winemaking teams for a personal & social experience as we explore the combination of good classic winter food with some hand-picked gems from our cellar. Great value & great fun. Space is limited for this double-header – so book early.